While I was well aware of British singer/songwriter Findlay Brown's previous work, his album's never crossed my desk, so I was oblivious to his music apart from the YouTube videos I would stumble across and enjoy. His songwriting was certainly above par, but there are so many less-than-average singer/songwriters polluting the airwaves that it's hard to weed them out. That's a real shame, to be honest. Especially since Findlay is so obviously talented. Well, when Love Will Find You landed on my desk recently, I was happy to finally experience one of his albums and formulate an honest to goodness opinion. Holy crap, I was NOT expecting to hear an album that would blow me away so completely, both musically and emotionally. Love Will Find You is one hell of an album that must be owned by as many human beings as possible. I don't get paid by the labels for writing these reviews: they are a labor of love. And this album is one of the few albums that I've heard in recent times that will appeal to so many music fans, young and old. 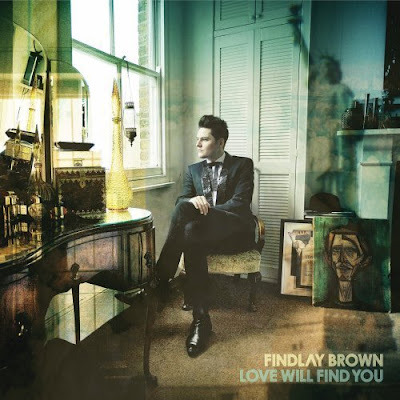 You see, Love Will Find You is not a typical Findlay Brown album, stylistically. With producer Bernard Butler (Duffy, Suede, The Tears, McAlmont & Butler) twiddling the knobs, Findlay has stepped back in time and created an album that retains his melodic songwriting skills yet takes his music into an era that existed even before he was born. The best way to describe Love Will Find You is this: imagine Roy Orbison and The Everley Brothers flying over to the UK in the mid-'60s and recording an album in the midst of the Merseybeat boom. Add some gorgeous melodies, lush strings, big Spector-like production and a whole lot of love and you've got Love Will Find You . While Findlay doesn't possess a soaring set of pipes like Orbison, he is still a force to be reckoned with. The album may be an aural homage to a more innocent time when music was created to 'touch' the listener, Findlay's songwriting and vocals reveal an artist much more sophisticated than his previous albums let on. Love Will Find You is not just an album to listen to: it is an album to feel, to experience, to love and to cherish. There are moments here that are joyful and life-affirming including "Love Will Find You, "Nobody Cared" and the gorgeous "Everybody Needs Love". When an album is this good, it's really hard to pick a highlight. The whole damn thing is lovely. So, do yourself a favor: find someone you love deeply and unconditionally and give them a copy. Don't be a fool and burn them a copy. Don't illegally download it. Buy the damn thing and give it to them like you would flowers, chocolates or a kiss. This is a musical love letter that will reach down and touch that special someone like no other album before. Love Will Find You is a must-own, my friends. Listen to it, cry to it, long for it and hold it close to your heart. Your life will be much better for it.